Woven fabric does not stretch except on the bias. Woven fabric is made up of fibers which run straight at ninety-degree angles to each other. 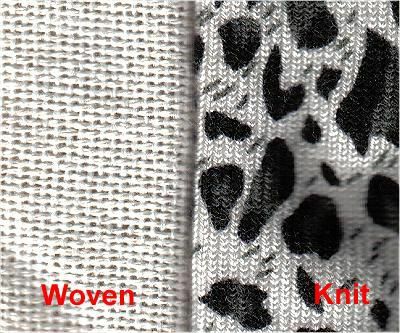 Knit fabric has loops of fiber that allow the fabric to stretch. The amount of stretch and the direction of stretch are all variables. A knit may stretch in one direction, or it may stretch in both directions. This is an important consideration when choosing fabric for a specific pattern. For example; A bathing suit pattern will require an equal two-way stretch. If you choose a fabric that only stretches in one direction, the suit is not going to fit properly... if you can even get it on. Unless the fabric is a mashed fiber, such as felt, it has a lengthwise, a crosswise and a bias grain. Understanding fabric grain is important when laying out a pattern. As you read a pattern envelope, you will see different requirements for with or without nap. Fabric nap refers to the lay of pile on fabric with pile. Examples of fabric with nap are velvet, velour, corduroy and terry cloth. When cutting out fabric with nap, it is necessary to cut the fabric so that it will all be running on one direction. There are many new fabrics on the market that do not have pile but would require you to use the with nap layout. When in doubt there are a couple of ways to see if the fabric will need the "with nap" requirements. Brush the fabric with your hand one way and then brush the area next to that area the other way. Observe if the fabric looks the same when brushed in both directions. Using a length of fabric, fold the fabric lengthwise and lay the two directions next to each other. Observe if the fabric looks the same from each direction. One way designs are not always obvious. Any print has the possibility of needing to be treated as a one-way design. Some patterns are not suitable for one-way designs. A tote bag that does not have a bottom seam is an example of something that would not work with a one-way design fabric. On a no-seam bottomed tote bag the fabric folds to form the other side of the bag, once folded the fabric is going a different direction and may appear upside down. Because the fabric needs to go all in the same direction, it is necessary to buy the fabric amount that is called for under "with nap." Another consideration when buying a fabric with a one-way design is matching the design. It may be necessary to buy extra fabric to match the design. The size of the print and the number of times you will be able to use the width of the fabric guide your decision about how much extra to buy. Never assume the fabric will be there if you need to come back for more. Plaids are a fabric that must be matched at seams and intersections. Not matching the plaids will distract from the finished appearance. The size of the plaid and the number of times you will be able to use the width of the fabric will guide your decision as to how much extra fabric will be needed to match the plaids. Plaids require more consideration that a one-way design because the vertical and horizontal lines in the plaid will need to be matched. Some patterns will state that they are not suitable for plaids and one-way designs. Watch for this information on the back of the pattern envelope or pattern directions. Many patterns will say they are not suitable for diagonal prints. This is stated because it will be impossible to match the design even if it is possible in plaid or one-way design fabric. The very best choice for the first time you are sewing is tightly woven 100% cotton woven fabric. Its characteristics make the fabric " stick" together as you are working with it and it does not stretch. Thanks to the popularity of quilting 100% cotton are easy to find in almost any fabric store in a wide variety of colors and prints. Always avoid one-way designs, plaids and diagonal prints when you are choosing fabric for your first sewing project because they require special considerations when you are laying out the pattern. What Difference Does It Make When a Fabric Has Nap?